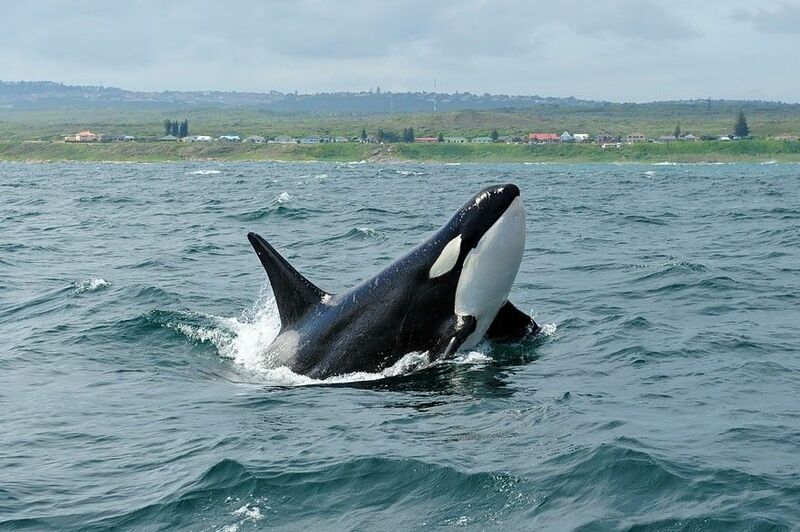 I saw my first group of killer whales near Bird Island in Algoa Bay on the 20th February 1999. It was a group of four (three adults and a calf) spotted near a Bryde’s whale. They had captured a baby bottlenose dolphin and were “flicking” it to each other using their large flippers. The cries of the baby dolphin were quite unnerving but are one of the cruel things in nature that are necessary for a top predator’s survival. In this case the whales were honing their skills just like when a cat plays with a mouse. Since then I have spotted them on numerous occasions from my whale watching boat and from the shore, but never armed with a good camera and being treated to such a show as on January the 13th. The photos were captured on a Nikon D700 (full frame) with a 24-70mm 2.8 Nikon lens. 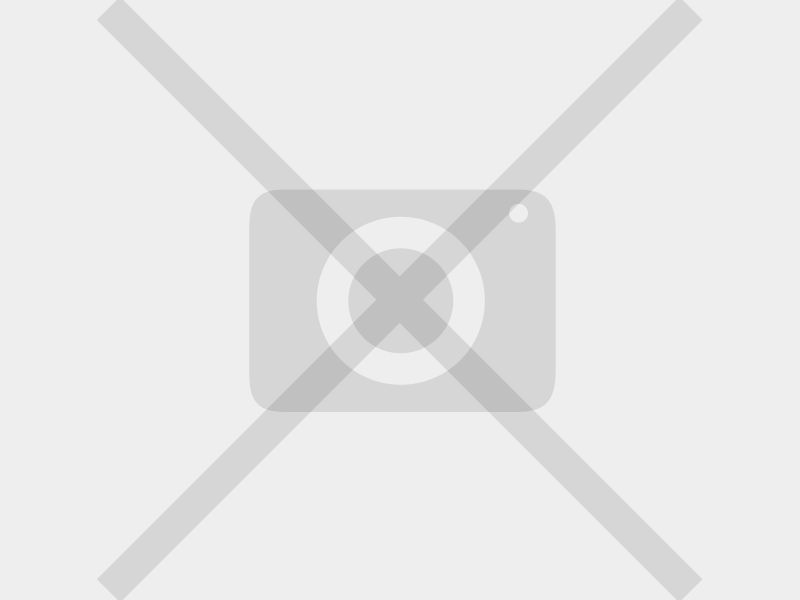 The photo gallery above depicts various forms of behaviour. There is some of the male killer whale “spy hopping”. They can change the shape of the lens in the eye which gives them excellent vision both in and out of the water. This is used to great effect when knocking seals off ice floes. They would suddenly pop out the water next to the boat and have a good look at who we were and what we were doing. Then there is one of the male “tail slapping” which may be a form of aggression to warn intruders to keep away from its calf, but scientists don’t know for sure what it means. They also seem to use their flukes to soften up their prey for consumption. There are photos of the female breaching which could be some form of communications to the other members of the pod, or may be simply for fun. There are photos of two kinds of barnacles, one on the male’s dorsal fin and others on the male and female’s flukes and flippers. According to Professor Peter Best, the round white one on the adult male fin is a Coronula sp. (whale barnacle), typical of humpback whales amongst others. It is partially embedded in the skin which means that it won’t easily be dislodged by predators, or the breaching of the whale, and it feeds by passively filtering food from the current generated as the whale swims. The floppy black ones on or near the trailing edge are probably Xenobalanus sp., found on a large number of cetaceans. Both pose no problem for the whale, but if they are noted as being excessive in number it may be indicative of an animal swimming somewhat slower than normal (i.e. possibly debilitated). Barnacles on fins and tails are far more common in warmer waters than they are in colder waters. So, we generally assume that animals we see here with barnacles, Xenobalanus in particular, have probably come down from warmer waters, maybe Natal, or even from the Agulhas current, but either way, the barnacles don’t tend to last too long in colder Southern Ocean waters. 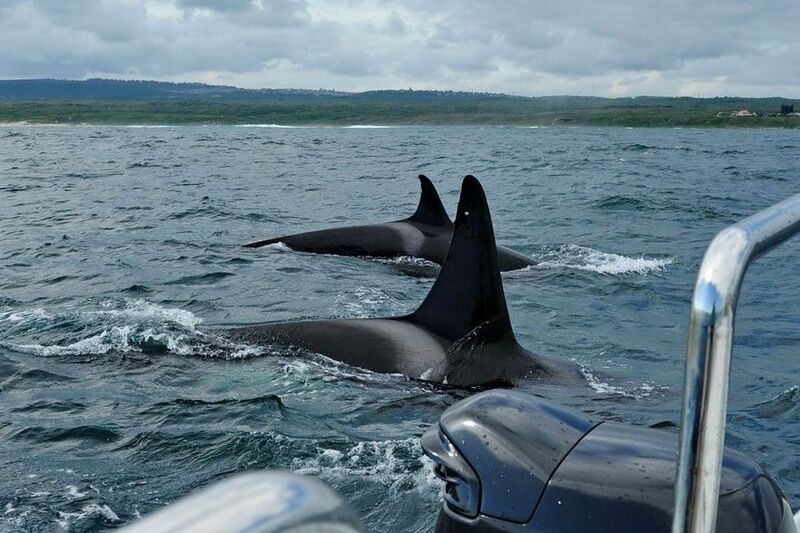 Have a look at the photo showing the shape of the whales’ dorsal fins and the grey saddle just behind the dorsal fin. Scientists use the notches and unique markings on the fins and saddles to identify individual animals. Killer whales are the largest member of the dolphin family. When any cetacean (group name for whales, dolphins and porpoises) attains more than four metres it becomes known as a whale (with the exception of the dwarf and pygmy sperm whales). Like many cetaceans these animals are known by two names. The name Orca is derived from Orcus, the Roman god of the underworld who tortured wrongdoers in the afterlife. The term killer whale probably comes from the fact that they do kill whales and were often seen feeding on dead whales during the days of whaling. These whales are the top predators in the marine ecosystem. Their diet consists of almost everything in the sea as well as some animals out of it. Animals eaten or harassed include twenty species of cetaceans, fourteen species of seals and their kin, dugongs, sea otters, eleven species of bony fish, twelve species of elasmobranch fish (sharks and rays), birds, turtles, squid and even deer and moose! There are several different types of killer whales across the globe, one of the main differences between them being in their diet. Some eat mostly dolphins or seals or large whales, others eat only bony fish or sharks and rays, while others still eat a combination of two or more of these prey items. The more specialised you become at hunting one kind of prey only, the more successful you will be as a predator. While fish-eating killer whales hunt in bigger pods and may, like dolphins, use echo-location to find their prey, it is very unlikely in the case of mammal-eating killer whales, which hunt in very small pods. They normally hunt silently and probably detect prey by listening for the sounds they are making or using visual cues. Females can live to a maximum of 90 years while males seldom reach more than 60 years of age. Killer whales are no doubt the world’s most widely distributed mammal, stretching from the Arctic to the Antarctic, in the tropics and from both coastal and oceanic waters. They do appear to be more abundant in cooler waters. 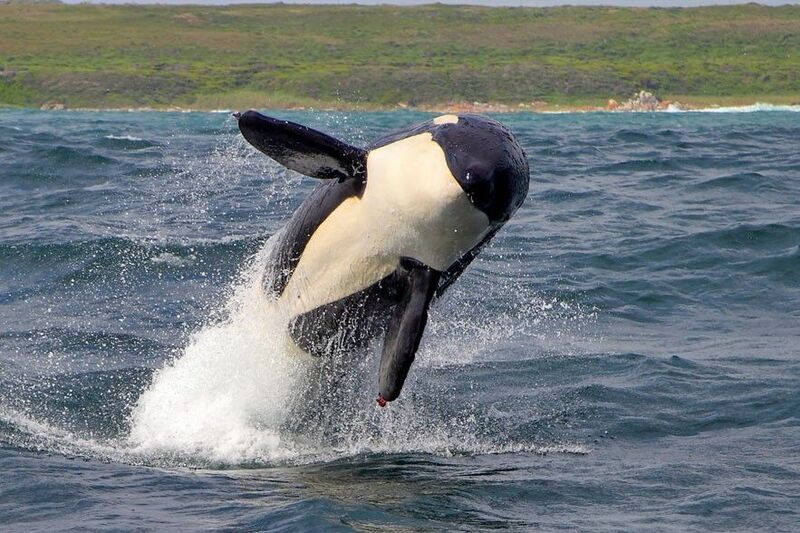 Killer whales can be seen anywhere along the southern African coast. 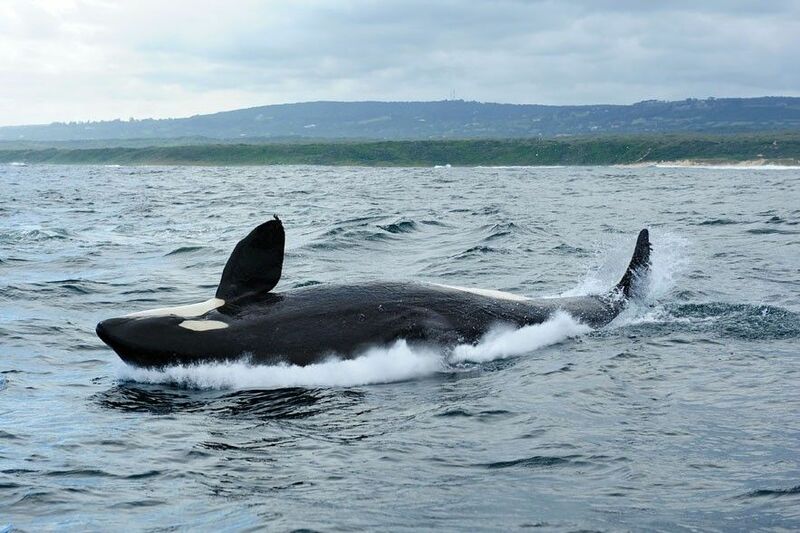 However they tend to be seen more frequently in places of heavy boat traffic like the Cape Peninsula, Plettenberg Bay, Algoa Bay and on the old whaling grounds. This does not mean they do not occur at other locations but just that there are not usually people there to observe them. In and around Algoa Bay their appearances are unpredictable and normally not more than twice a year, some years failing to arrive at all. We have observed them in any month of the year between Bird Island and Jeffrey’s Bay. An amusing sighting was in 1984 during the local University of Port Elizabeth’s “anything that floats” fundraiser. Students aboard their flimsy rafts were head for the finish line when a group of Orcas arrived making the students gap it off their floating crafts! Dr Vic Cockcroft who has been studying killer whales since then has only managed to identify seven or so males, which strongly suggests that there are not that many families out there. The last time they were spotted in the Eastern Cape was in May 2011 at the tail end of the “sardine run” off Cape Recife. This was when Raggy Charters hosted the filming of the BBC’s “Earth Flight” about the migration of birds around the world which is to be screened later this year. Watch out for spectacular 3D footage of the sardine run from along our coast. 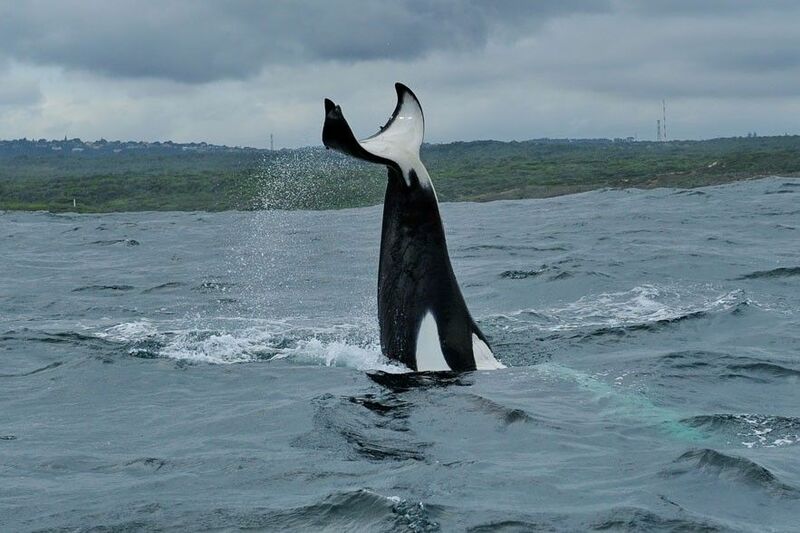 There have been 785 recorded sightings of killer whales along the South African coastline which seems a lot, but 627 of these observations were from surface long line vessels on the continental drop off on the Agulhas Bank. The other 158 were from sightings by scientists, boat-based whale watching operators, fishermen, skippers and their ilk. Strandings and animals taken by the whale industry make up the balance. As a result of the unpredictability of killer whale sightings along our shore, data are only collected on an ad hoc basis, if and when researchers encounter them at sea or, as is more often the case, via members of the public, fishermen and tourist operators who are often armed with good quality camera equipment, GPS’ etc. Meredith Thornton from the Marine Mammal Institute is currently collating all killer whale photographs and associated sighting information from all interested parties in order to build a photographic catalogue for South Africa. There are at least nine main types of killer whales in the world, two in the North Atlantic, three in the North Pacific and four in the Southern Hemisphere and the list is growing! There are the so-called resident pods which feed mainly on fish and occur in a wide range of group sizes ranging from three to about 60 animals. Then there are the mammal-eating ones that are called transients. They occur in much smaller groups of between one and four animals although occasionally up to fifteen. These are the ones that I have been seeing along our coastline over the last twenty years. They seem to use a hunting method called passive sonar where they listen out for sounds made by other cetaceans and then use ambush tactics, communicating with each other once a kill has been made. This seemed to be the case on 27th January 2003 when we observed two adult female killer whales and a calf creeping up on 400 bottlenose dolphins cowering away in a sheltered bay at St Croix Island in Algoa Bay. In the Southern Ocean, recent observations have revealed the possible existence of four types of killer whales. In all types the dorsal fin continues to grow in both sexes but with a delphinid shape, in females and juvenile males. In adult males the fin not only gets bigger but becomes more triangular in shape and can attain 1.8 metres in height. 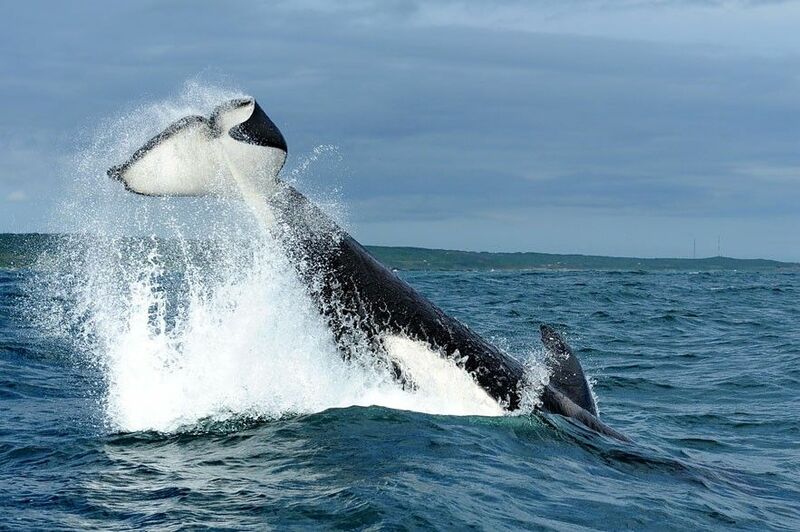 In males up to six metres the dorsal fin is about 10% of the body length while in males over 6 metres it is on average 18% of the body length. On the killer whale we observed the fin actually wobbled when the animal surfaced, and because it is not supported by bone or cartilage it can curl over to one side as often observed on captive animals. Males also have larger flippers and tail flukes than females as can be seen in the attached photos. Killer whales can often be confused with humpback whales as the underside of their tail flukes is sometimes also black and white like those of killer whales. 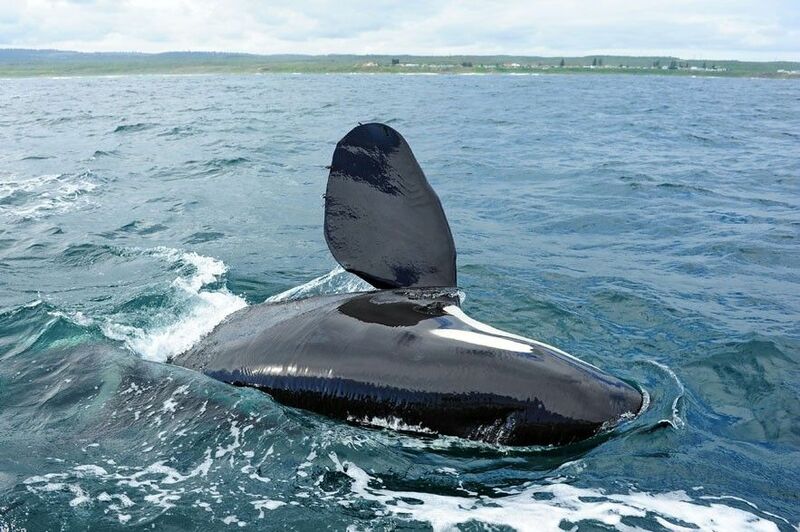 Also, when a southern right whale lies on its side its tail often resembles the dorsal fin of a killer whale. 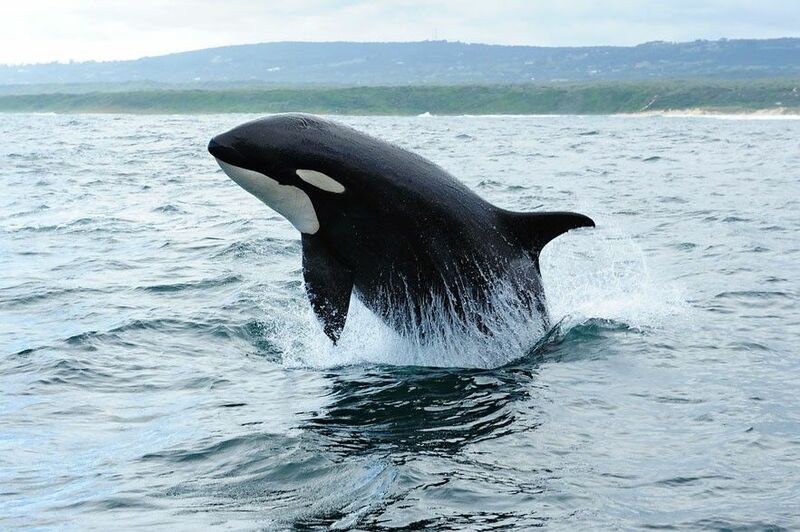 Type A is the killer whale that mainly frequents our shores. There is increasing evidence of a second type A, which is smaller and so far unnamed, which has also been observed here. The largest males are almost nine metres long while the females reach almost eight metres. Most females seldom reach seven metres while 50% of males do. Males can weigh up to five and a half tones while females are smaller. They have a moderately sized white eye-patch. Around the Antarctic they prey mainly on minke whales. In our waters they prey predominantly on dolphins (I have observed them eating both common and bottlenose). Although they do prey on Cape fur seals they do so surprisingly infrequently considering that we have over two million of them in South Africa and Namibia. They also take penguins, cormorants and white-chinned petrels. There have been many reports of killer whales taking hooked tuna off commercial long lines on the Agulhas bank to such an extent that fishermen leave the area. Retaliatory actions by frustrated fishermen include shooting or the throwing of “thunder flashes”. There have also been reported attacks on southern right, humpback and fin whales. When attacking southern rights the killer whales try to split up the group or cow and calf pair while the whales try to group as close as possible together. Once the animals are killed the killer whales usually only eat the tongues which seems like a delicacy to them. 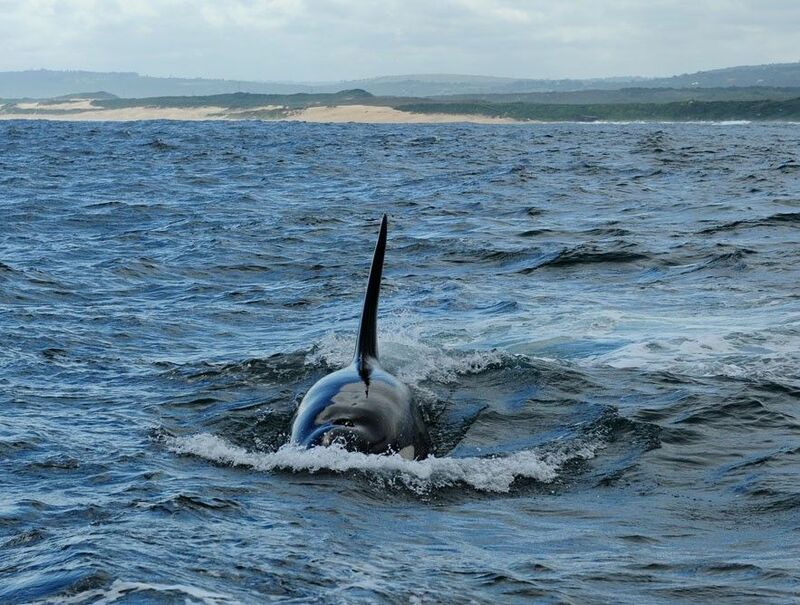 In Plettenberg Bay in 2002 a male killer whale from a group of three killed a four metre great white shark. The male and female then came and displayed it to the boat based whale watching boat! The group size of Killer Whales from the 627 sightings by long line vessels showed that all except one was of up to 13 animals. The exception was a group of twenty. In 93% of the observations the group size was up to six animals, the average being two. Other datasets shows 81% of the groups being up to six animals, the rest up to ten with an average of four and a half. Boat based whale watching operators reported between one and two calves present in ten of the 15 sightings. I have seen calves in all of my sightings although they are sometimes difficult to distinguish at first. Type B inhabits inshore waters around the Antarctic and is closely associated with continental pack ice. The eye patch is twice as large as type A and it has a grey cape on the body behind the dorsal fin. They prey mainly on seals but also on minke and humpback whales. Type C also inhabits inshore pack ice in the Antarctic. The eye patch is diagonal and slopes down at the front. They are smaller than type A, the males attaining six metres and the females slightly less. They feed mainly on fish. The Antarctic population was estimated at about 80 000 individuals in the 1980s. They have not been heavily exploited by whalers in the past. From 1935 until 1979 on average 26 were killed every year. During 1979-80 Soviet whaling ships killed 916 animals in the Southern Hemisphere. South Africa is not blameless however as between 1971 and 1975, 36 killer whales were taken at the Durban whale station. It is a huge privileged to observe these wonderful animals along our coastline and we can only hope that with the cessation of whaling that they will increase in numbers and be observed more frequently. 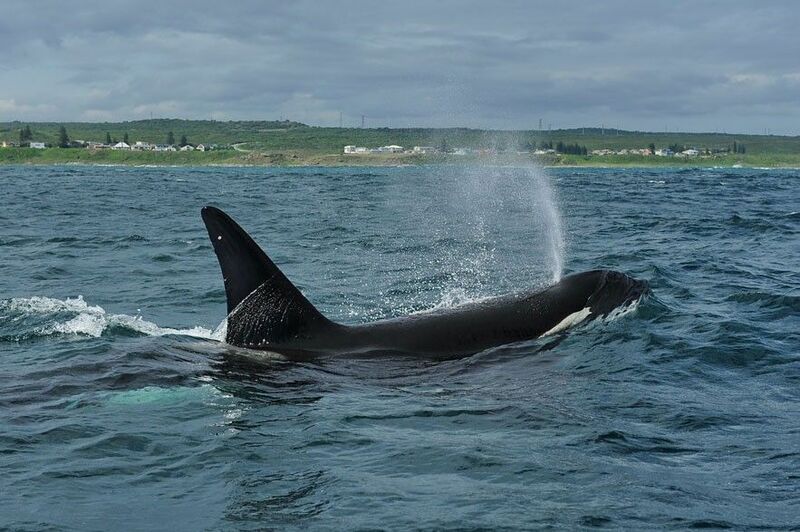 If anyone spots killer whales in the vicinity of Port Elizabeth they are please to call Raggy Charters on 073 15 22 77 or Lloyd Edwards on 084 55 222 77. Once we have made a positive identification you are welcome to join Raggy Charters on our whale watching boat at no cost in order to get close up footage, which will also be passed onto the relevant marine whale scientists. We have the only boat based whale watching permit for Algoa Bay which allows us to engage in close encounters with cetaceans. Lloyd Edwards, Seaview, Port Elizabeth, 12th March, 2012. 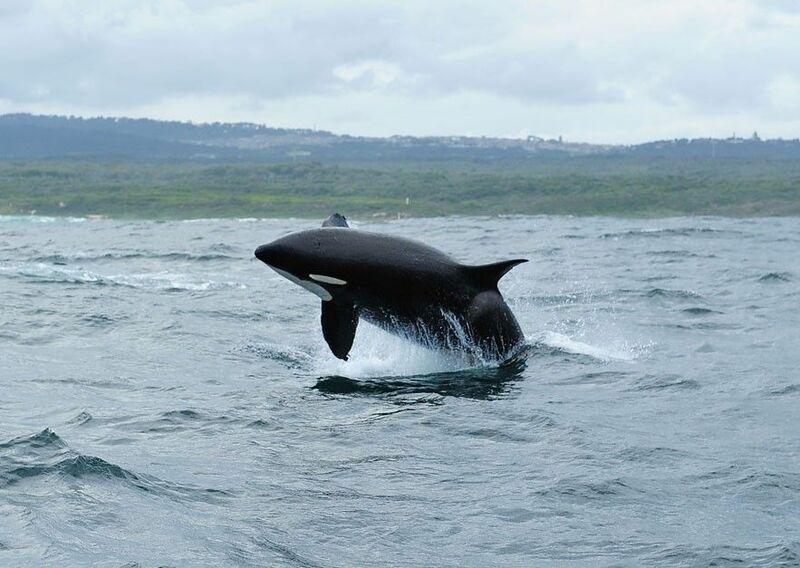 Killer whales in SA waters. PB Best, MA Meyer and C Lockyer. March 2010. African Journal of Marine Science. Best PB. 2007. Whales and dolphins of the southern African sub region. Cape Town. Cambridge University Press. Cockcroft Vic, Joyce P. 1998. Whale Watch. Cape Town. Struik Publishers. Edwards LC. 2005. Scenes from Algoa Bay, a photographic guide to the marine mammals of Port Elizabeth. The Advertising Empire. Logbook of Commercial Whale Watching Vessels “Orca PEC 3 and Orca 2 PEC 17” December 1997 until 2012 and Penguin Research Vessel “Winkle” June 2011 until February 2012. Thanks to Professor Peter Best, Dr Vic Cockcroft and Meredith Thornton for their useful comments and allowing me to make use of their information. 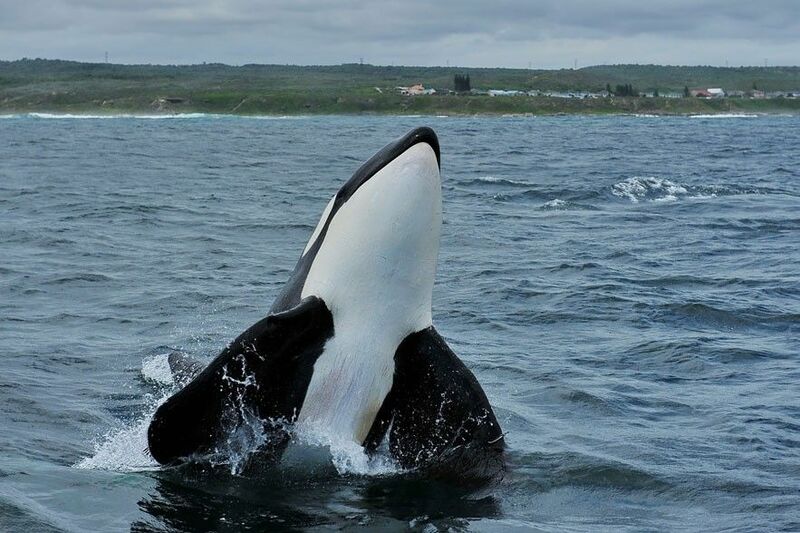 This article on killer whales will make up one the chapters in my new book on the marine life of Algoa Bay which will hopefully be published when the economy recovers! Anyone wishing to purchase A2 size photographs of killer whales like those attached can call me on 084 552 2277. Proceeds will go to the Penguin Research fund.